Every Haunted House objective sounds simple, but the game’s mechanics turn them into a trial. Project Zero 2: Wii Edition is without a doubt one of the best re-releases I’ve ever played. The updated graphics and substantial gameplay tweaks enhanced the game’s fear factor, as I discuss in my review of the game. However, I did feel the Haunted House mode, a new addition to the re-released version of the game, pales significantly in comparison to the main story in its attempts to scare, and I’d like to discuss why this is the case. For the uninitiated, Project Zero 2 (also known as Fatal Frame 2: Crimson Butterfly in the US) is a horror game in which you play as a young girl trying to escape a village filled to the brim with spirits. Your only means of defense throughout the ordeal is the Camera Obscura, a camera that can be used to exorcise these spooks. The game places a heavy emphasis on exploration and the mythos behind the village. Played in third-person with a first-person perspective for combat when using the Camera Obscura, there is a real sense of your character’s fragility; ghosts move unpredictably and can do devastating damage. Search for a doll while avoiding a certain ghost. So what’s this ‘scare meter’ I mention? Haunted House tracks how scared you are based on “unnecessary” movements of the Wii remote, with your totals being represented by a meter on screen. It’s a neat idea, one that might have given Haunted House mode a little more novelty, but it’s also the core problem. Swarms of enemies can’t hurt you, only frighten you. adjustment to my seating position once boosted my meter by 500 points. The system apparently cannot tell the difference between a reaction to a jump scare and a mild movement. Due to its finicky implementation the scare meter ends up being somewhat random; it is unfortunate that the value is considered at the end of each game when judging whether the player wins or loses. Problem two stems from the fact that the scare meter is shown to players in the first place. Part of the beauty of Project Zero 2 is that the user interface is clean and unobtrusive, but in Haunted House mode it’s a very conspicuous on-screen element that doesn’t tie in aesthetically with the rest of the game. The inclusion of the scare meter is questionable to begin with–how frightened you are isn’t a currency that needs to be explicitly stated on screen. It’s not something you can compare to, say, health or ammo, simple numerical values that are predictably calculated over the course of play. Not only is the calculation of the meter flawed, its presence on the screen is superfluous. These flaws essentially force the player to be cautious to the point that it is impossible to get immersed in the world. It’s obvious that the whole point of Haunted House is to scare the hell out players, but it quickly loses its power and becomes one of those steady hand tests. The other objectives are more successful, but these have glaring issues as well. Objective 2 arms you with the Camera Obscura and requires you to take a number of photos of a certain ghost that makes scripted appearances. The problem is that said ghost only appears the exact number of times that you need to photograph it, meaning that if you miss it once, too bad. Haunted House is on-rails but the way the controls are phrased implies that you can turn around and revisit areas. Unfortunately this isn’t the case, and it makes playing Objective 3, during which you need to pick up dolls while being chased by a ghost, a frustrating experience as well. Did you miss a doll? Tough. This is in direct contrast to the backbone of the gameplay of Project Zero 2’s main campaign, in which exploration is key to advancing. Even more annoying is the dissonance between what the game tells you and what actually happens; the game suggests that the ghost in Objective 3 can be banished by turning around. What the game actually means is that you should turn around when you feel the controller vibrate, or that ghost isn’t going anywhere. 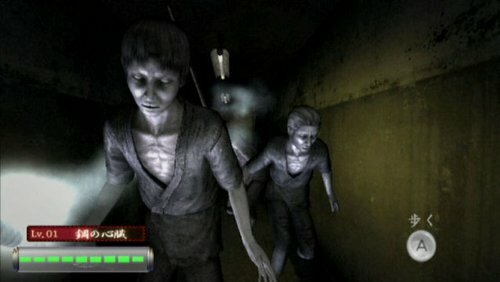 Ju-On for the Wii is a game with similar ideas, but much better implementation. and Paranoia to how often you check your surroundings. If the scales at the end look fudged, that’s probably because you sneezed or had to scratch your head. If the scare meter is too low at the end, Lady Kureha, the caretaker of the Haunted Houses, notes that she will make subsequent attempts more frightening. Intriguing, given that that the appearances of ghosts in each stage are random, essentially making every playthrough different. Unfortunately, at least in my experience, this just meant that the same type of ghosts would appear more frequently, at least a dozen times in a seven or eight minute playthrough. Shocking the first time, laughable and/or irritating after. Playing Haunted House mode, I couldn’t help but compare it to Ju-On, a game based on the popular Ju-On/The Grudge films that came out a few years ago. 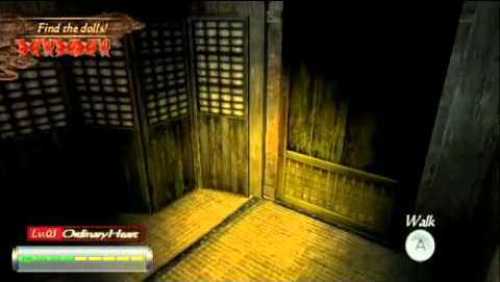 Similar to Haunted House mode, Ju-On bills itself as a first-person fright simulator in which players walk through decrepit locations while scary things happen. The difference is that in Ju-On, there is a sense of desperation that you would expect from a horror game. 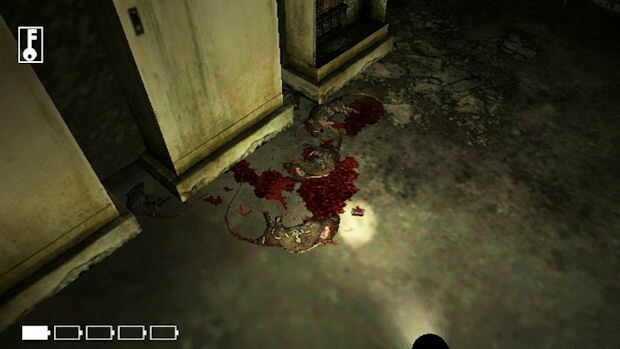 Unlike Haunted House mode, there is no easy checklist of objectives to complete; much like a traditional survival horror title, exploration is required to find items or trigger events that will let you progress. More importantly, exploration serves as a method to highlight the player’s vulnerability. Spending too long in one area can be dangerous: if you run out of flashlight batteries, it’s game over. Certain actions cause a ghost attack, and you must complete a quick-timer event to flee. Again, failure results in a game over. The fact that you can die in ways that make sense in the context of the game puts Ju-On leaps and bounds ahead of Haunted House mode’s attempts to convey horror. Furthermore, Ju-On also employs some sort of fear detector, but it doesn’t rely on a visible meter; the results of the detection are simply part of the final score displayed when a level is completed. Its implementation of this idea is definitely far better than that of Project Zero 2’s. Suspension of disbelief is important in all video games, but especially in survival horror. When done right, such as in Project Zero 2’s story mode, it makes for an incredible and terrifying experience. Project Zero 2’s Haunted House mode makes a noble effort to replicate the feeling of visiting a haunted house attraction, but its hamfisted approach results in player frustration rather than fear. The only thing scary about it is how wrong it all went. I totally agree- HHM was a disaster, and I’m yet to meet a person who thinks otherwise. I think it was an idea brought on by Nintendo for an attempt to bring a casual aspect to the extremely niche Fatal Frame, but it just didn’t work- and the worst thing is, it took up so much disk space there was no space left for Mission mode! In the Iwata asks interview, they mentioned that it was designed to give a taste of Project Zero’s style of horror to people who wouldn’t be interested or able to play the story, a failure in itself as HHM is really just procuring jump scares in a way completely different to the story. Still, the game as a whole is fantastic and would easily take place as my second favourite game in the series (And thus second favourite game ever). New Broken Neck Woman, Fallen Woman and the new Frozen Butterfly ending make up for all possible mistakes. More interesting however, is that there is in fact, a multiplayer aspect to the story mode! It is very simple- Player 2 can press A at the same time when Player 1 is taking a photo to do extra damage. It’s not much, and it’s very difficult to co-ordinate, but it’s interesting. Hi C McKay, thanks for taking the time to comment (twice)! I did play around with HH’s multiplayer mode for a while; I wondered why spooky things were happening so frequently but as it turns out, my friend was rapidly pressing buttons. I thought Lady Kureha was starting to flip out a little. Thanks for sharing this, I did not know! I’m interested in knowing more about this. It sounds to me like a pretty shallow way of encouraging multiplayer interaction, but it will be cool to test out. Yeah, it’s not very deep or anything. Because it’s quite an interesting game to watch besides and I would guess it aims to create a kind of shared panic in fights. It’s not too good, but interesting for the fact that they actually tried some multiplayer out. I think it’s a real shame how this game has pretty much flew under the radar, because it’s really one of the best horror games of this generation in my opinion (Somewhat poignant that one of the best horror games of this generation is from the last), and I’ve heard really bad news of the sales, although I don’t know how reputable the source is. Nevertheless, I’m sure the series will get a new installment on WiiU, whether it makes it abroad or not, I don’t know. This must be the first time ever I have seen Ju-on compared favorably to anything.